A sundown town is a town that is whites only, particularly after dark. Although Americans typically associate racism with the Deep South, sundown towns are primarily a Northern and Western phenomenon. Because of the South’s historical dependence on black labor, Southern communities needed black residents—they oppressed and exploited them, but tolerated their presence. 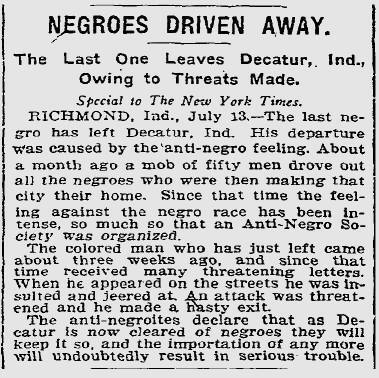 Elsewhere in the country, however, blacks and other people of color were regarded as “undesirables”, and during the late 19th and early 20th centuries, hundreds of communities forcibly expelled them, while newly formed towns and suburbs were often designed as whites-only from the start. If he hesitates, little stones begin to reach him from unseen quarters and soon persuade him to begin his hegira… So long as he keeps up a good gait, the crowd, which follows just at his heels, and which keeps growing until it sometimes numbers 75 to 100 boys, is good-natured and contents itself with yelling, laughing, and hurling gibes at its victim. But let him stop his “trot” for one moment, from any cause whatever, and the stones immediately take effect as their chief persuader. When traveling by bus or train, African-Americans had to take care not to get off at the wrong town. Staying aboard wasn’t always enough; black porters on trains passing through areas where anti-black sentiment was high would sometimes hide during station stops. Black automobile drivers, of course, were also at risk, especially if they got lost or broke down in the wrong place. In the latter half of the 20th century, as public attitudes towards racism shifted, many white communities suppressed or forgot their own histories. People grew up in sundown towns without being consciously aware that they were sundown towns—the absence of black people seemed natural, not the result of deliberate policy. But the policy often persisted, and for the same reason: It’s natural to be suspicious of people who obviously don’t belong… and to call the police, just in case. For much more about the history and legacy of sundown towns, I highly recommend James. W. Loewen’s book on the subject.